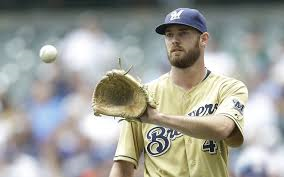 Brewers rookie hurler Taylor Jungmann will probably get three or four more starts before the close of the 2015 season. For the 25-year-old right-hander, another win in one of those games would give him 10 wins for the season. That would make him the 14th rookie pitcher in Brewers history to win 10 or more games in a rookie season. Jungmann’s nine wins puts him second on the list of rookie pitchers in the majors this season (he is one of three pitchers with nine wins; Chris Heston of the Giants leads all first-year pitchers with 11 victories). Teddy Higuera holds the Brewers rookie record with 15 wins. The last Brewers pitcher to win 10 or more games in a season was Wily Peralta in 2013. Jungmann is one of four Brewers rookie pitchers to win a game this season. Michael Blazek has five wins, and youngsters Zach Davies and Ariel Pena each have one win for the ‘Crew this year. The four Brewers rookie pitchers with at least one win this season is the 20th season since 1969 that the team has had at least four rookie pitchers collect a win in a season. The most rookie pitchers to win a game for the Brewers in a season was eight in 1995. Those eight pitchers were: Steve Sparks (nine wins), Sid Roberson (6), Brian Givens (5), Scott Karl (5), Mark Kiefer (4), Jamie McAndrew (2), Ron Rightnowar (2) and Alberto Reyes (1). The 2013 Brewers had seven rookie pitchers with a win, second-most in team history. Jungmann became the 36th Brewers pitcher to pitch a complete game in his rookie season and he became the 34th Brewers hurler to throw 100 or more innings in his first year with the team. A strong finish by Jungmann would also help his case for mention in this year’s National League Rookie of the Year Award. Seven different Brewers first-year pitchers have finished in the Top 10 for the ROY voting in the team’s history: Teddy Higuera (second in 1985), Bill Parsons (second in 1971), Don August (fourth in 1988), Cal Eldred (fourth in 1992), Jeff DiAmico (seventh in 1996), Doug Henry (eighth in 1991) and Steve Sparks (ninth in 1995).